Man killed in M5 crash Jump to media player A man has died in a crash involving a coach, a lorry and three cars on the M5 in Gloucestershire. Many hurt as M40 coach overturns Jump to media player Seventeen people are taken to hospital after a coach overturns on the M40 in Oxfordshire. 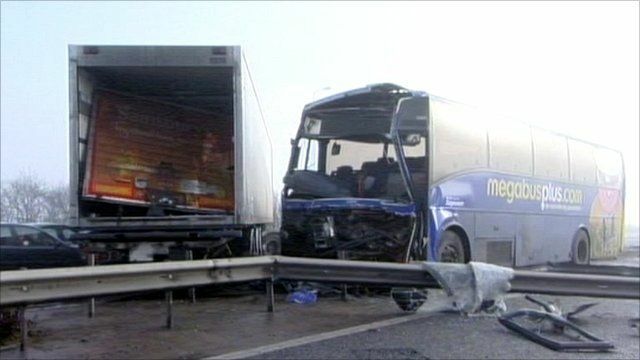 A man has died in a crash involving a coach, a lorry and three cars on the M5 in Gloucestershire. The 30-year-old, from Birmingham, was driving one of the cars, which collided near junction eight at about 0700 GMT. Three of the passengers on the single-decker megabus.com coach were taken to hospital but their injuries are not life-threatening. Acting Sgt Richard Davis from Gloucestershire Police said there was heavy fog at the time of the incident.